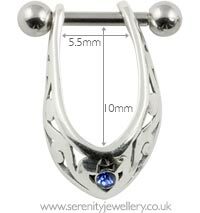 16mm long sterling silver or surgical steel celtic design ear shield inset with one crystal on a 316L surgical steel 8mm bar with 3mm screw-on ball closure. The shield is very pretty but it is fiddly to get in. 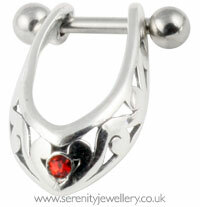 A gorgeous piece, sadly mt piercing is too low down for it. But it's beautiful! Really eye-catching, have received loads of compliments. Excellent product. Very comfortable. Quick delivery. Sunday, 22 July 2012 | Sarah. Beautiful item. Sits lovely on the ear. A little fiddly to put in, but worth it. Really pretty and surprisingly I forgot I was wearing it and slept in it.